Anyone have experience with the LifeStraw or feedback on it? "LifeStraw is a water filter designed to be used by one person to filter water so that they may safely drink it. It filters a maximum of 1000 litres of water, enough for one person for one year. It removes 99.9999% of waterborne bacteria and 99.9% of parasites. The LifeStraw Family, a larger unit designed for family use, also filters out 99.99% of viruses." i dont have experience with those but ill probably buy one of those for the other bobs i have for the fam. i believe they work cause they were pronounce greatest idea of 2005 and they ship em all over the world to less fortunate countries with bad water sources. if your on a budget, thats def the way to go. youtube has a lot of reviews on just about any product you can think of. check em out. Better than nothing. It doesn't do squat for chemical contamination but you will not get sick from bugs. I've been trying to decide on a couple of those myself. I can't afford the bigger ones so i've been doing quite a bit of research. From what I understand is they filter out most of the bacteria and viruses but not so great as in if a nuclear disaster. But what the heck, they're better than nothing. I think I just made up my mind up. Duh. In a nuclear disaster, most filtration units will be fine. Water does not become radioactive but it is the particulates and impurities that can become radioactive. So a good filter can handle that. The problem is that the filter itself becomes radioactive because of the particles it filtered. In the wild, whether after a nuke incident or not, always pre-filter through a tightly woven cloth or a coffee filter. A great item to add to your BOB is a ziplock full of coffee filters. A cloth diaper works well, or a bandana. In a nuke situation that keeps at least most of the radioactive particles out of your filter. In non-nuke it makes your fitler last longer. 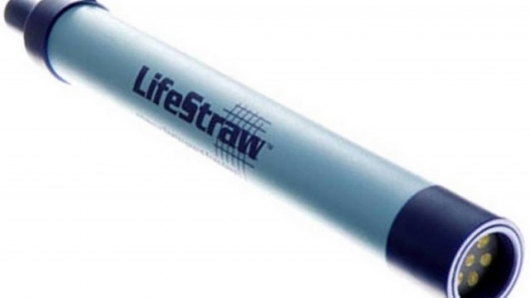 Biggest drawback of the Life Straw is it is only good for 264 gallons of water. The Sawyer Squeeze or Sawyer .01 is good for a million. The problem is that the filter itself becomes radioactive because of the particles it filtered. This was what was keeping me from getting the straw but I have finally reconciled my mind to that I may never have to worry about nuclear fallout and there's a whole bigger chance that water will be contaminated by other problems. Duh, I wasn't seeing the forest for the trees as the old saying goes. Its worth the 20 bucks, and works even better if you pre filter the water through a bandana into a cup or can, and drink through the straw from that. The water tastes fine, and it does a good job with stream and lake water. I used mine as a primary on over nights, and in a bug out type of situation you can just drink n go. What happens after filtering 264 gallons of water? Is it possible to clean it or do you have to throw it away? I bought two of these for our packs. Never used them before but they had great reviews. SO should I feel 99.9999% comfortable drinking out of any dirty water source. Just looking for more user feedback. Any place I should NOT use this? thanks.